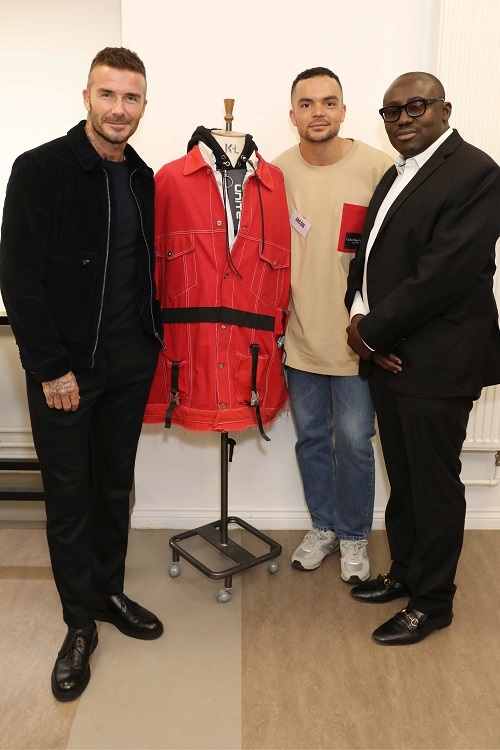 Manchester Metropolitan University was delighted to welcome David Beckham to Manchester Fashion Institute on Friday - the day that he was appointed as Ambassadorial President for the British Fashion Council (BFC). 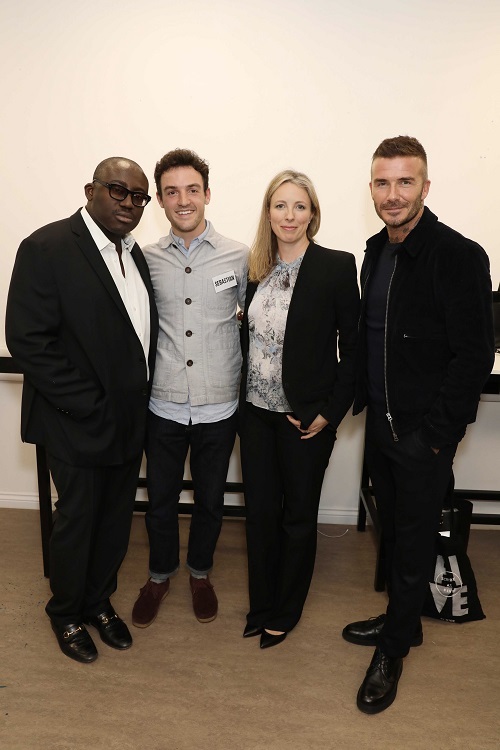 The former Manchester United and England footballer and global fashion icon was accompanied by newly appointed BFC Chair Stephanie Phair, Menswear Chair and British GQ Editor Dylan Jones, BFC Chief Executive Caroline Rush, BFC Reputation Pillar President and 10Magazine Editor Sophia Neophitou, BFC Ambassador for Emerging Talent and Vogue US Chief Critic Sarah Mower and British Vogue Editor Edward Enninful. 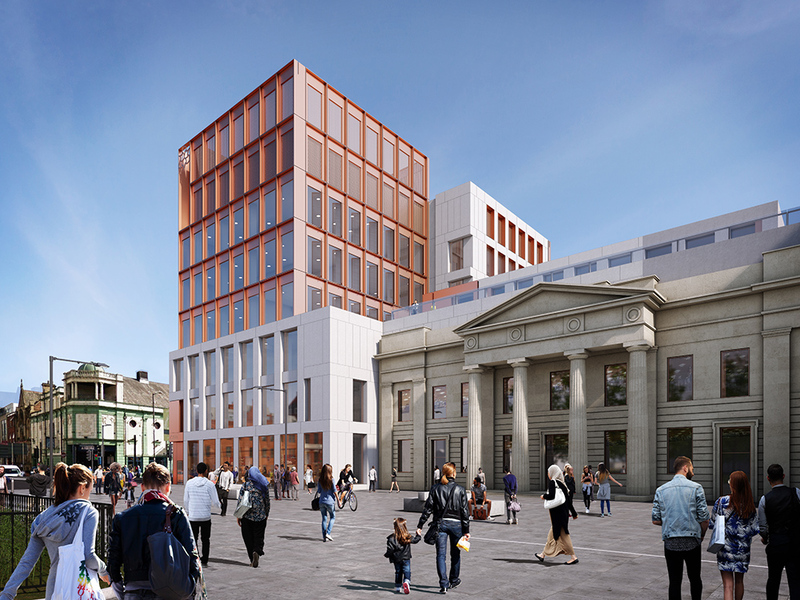 They met with staff and students to find out about the breadth of teaching and public engagement projects offered at Manchester Fashion Institute to those interested in a career in all parts of the fashion industry – from business to design and technology. Beckham’s new role includes supporting the BFC across their Education pillar – helping them reach young talent from all backgrounds across the UK through BFC run Saturday Clubs, scholarships and apprenticeships and via increased engagement in arts education. 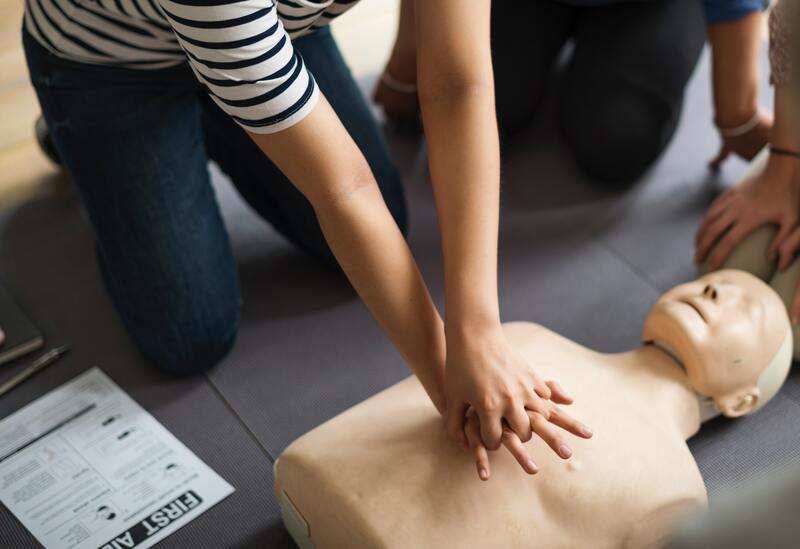 Manchester Metropolitan is the first university he has visited in his new role. Beckham and other BFC guests met representatives from Manchester Fashion Institute’s Fashion and Business Saturday Club. Organised in partnership with the National Art & Design Saturday Club and the BFC, it provides a unique opportunity for 13-15-year-olds to explore study opportunities for a career in the fashion industry beyond simply design. In total, 65 young people have been through the Fashion and Business Saturday Club at Manchester Fashion Institute. The guests also met the participants from the Portrait Youth project, which ran in collaboration with members of Manchester Youth Council. This culminated in an exhibition at Manchester Central Library last year featuring portraits of young people that explored their individual and civic identities through style, fashion and dress. 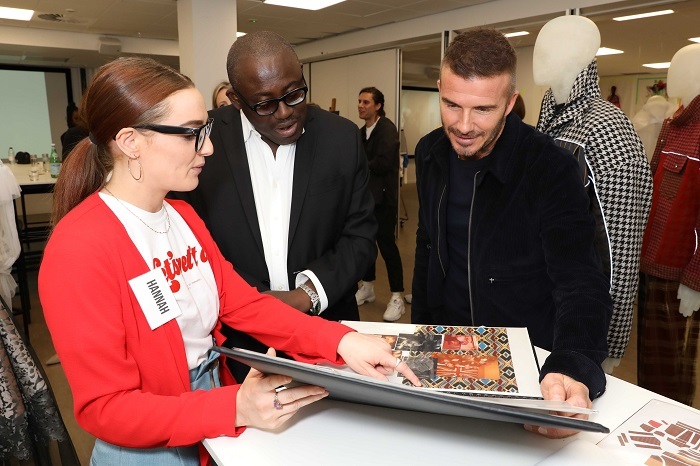 Beckham and fellow board members also met with Nabil Nayal, PhD student and award-winning designer and 2017 Manchester School of Art BA Fashion graduate and BFC scholar Jacob Kane and were treated to a showcase of the collections of final-year BA Fashion Design and Technology and Fashion Buying and Merchandising students. Sebastian Collinge, a final-year BA Fashion Buying and Merchandising student, presented his shoecare products Attirecare to the visitors, which he produced as part of his business project. Beckham took some of his samples away with him. 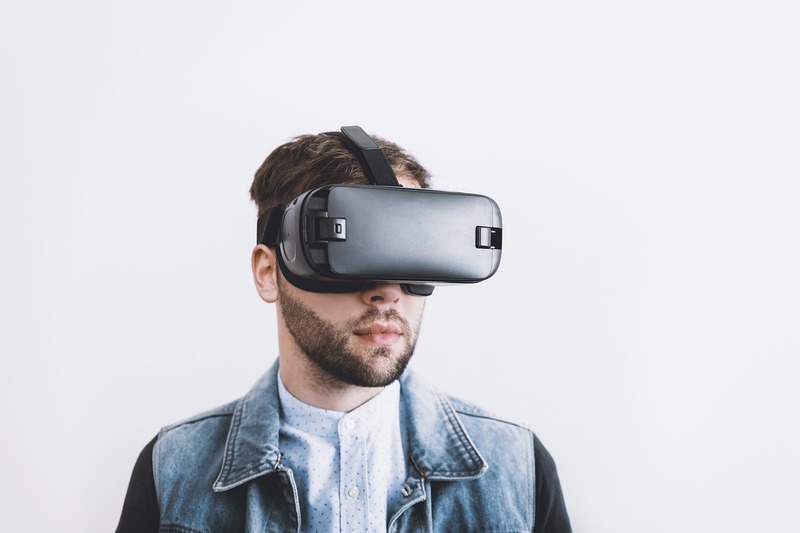 The visitors took the opportunity to try out the Fashion Institute’s 3D body scanner, which uses infrared depth sensing and image technology to produce a digital copy of the surface geometry of the human body. This 3D data can then be exported for pattern construction and garment draping simulation. 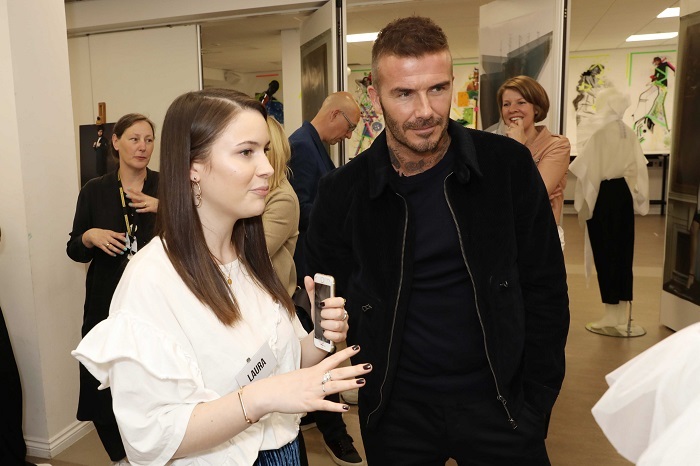 Jo Jenkinson, Principal Lecturer in Fashion at Manchester Fashion Institute, Manchester Metropolitan University, said: “We were delighted to host David Beckham and the rest of the BFC team at Manchester Metropolitan University.